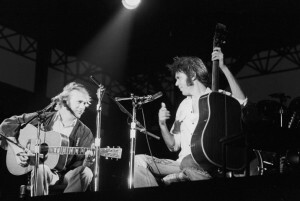 Stephen Stills and Neil Young circa 1976. Stills spent the rest of the night in the Holiday Inn bar, nursing drinks and talking with fans. Somewhere in the early morning hours, he was even coaxed onstage for jams at the house band on “The Thrill is Gone.” Less than an hour after he finally headed upstairs to retire, the morning paper’s review was out. The assessment was more bewildered than negative. Like most every other review thus far, it wondered why Young had ever taken on such a project. At 30, Young has begun more than ever to realize his potential. Besides working on a screenplay, he write several songs a day, has a few complete albums in the can and maintains an entirely separate career with Crazy Horse. Stills, now 31, knows full well that his solo work has lack critical importance in recent years. “These last two years,” he said, “I’ve been concentrating on my guitar work. I want to be considered one of the masters.” As result, the emphasis has gone off what was once Stills’s strongest area – songwriting. When his last album, Illegal Stills, was ignored in most circles, including Rolling Stone’s review section, he was very disappointed, but he said recently, “I’ll tell you something. I’m gonna keep at this until I win back every last person. The changes which that relationship has undergone must strike Neil as ironic at times. Stills was the one who brought him into Buffalo Springfield and later Crosby, Stills and Nash. Young, at that point, with little more than a hired gun – another electric guitar to toughen up CSN’s sweetness-and-harmony image. Young caught on quickly. Today, it’s that same hired gun whom everyone expects to call most of the shots. 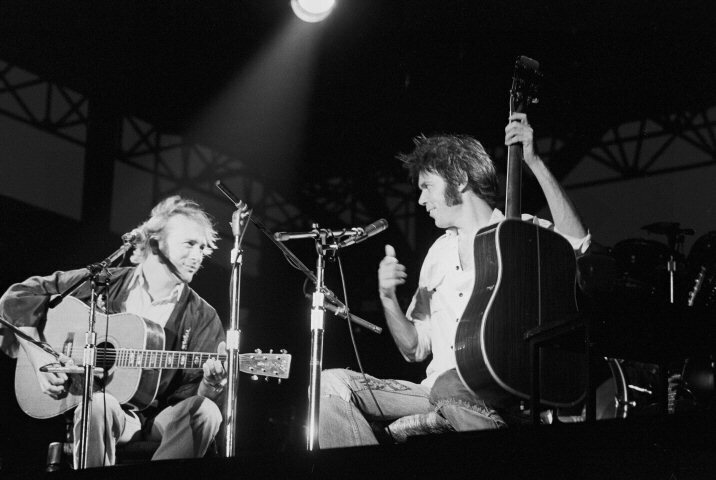 Whenever CSNY tries at another reformation, it is usually because Neil has expressed interest. But – and here’s the snag – Neil Young is not a pressure performer. His constant frustration is that he must stand in a spotlight. Neil did not forget. Four months later, he “just showed up” backstage at Stills’s Stanford University appearance. Neil watched the show and finally wandered out for the acoustic set. When he turned up the next afternoon in Los Angeles for Stephen’s concert at UCLA’s Pauley Pavilion – again without warning – Young was equipped with his electric Les Paul. He and Stills dueled guitars far into the night, dazzling themselves and the audience to no end. “The spirit of the Springfield is back,” Stills shouted in ecstasy. The commitment has been made. When it came to America, though, Neil returned to Stills. The two flew to Miami and began work on an album. 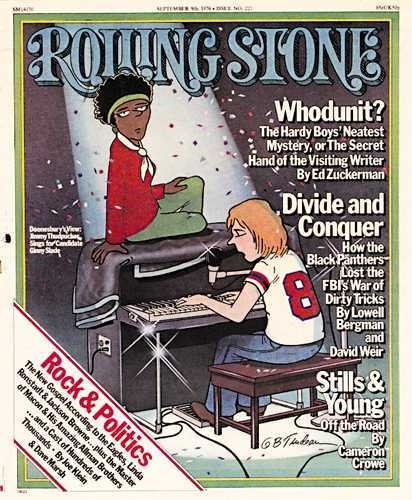 Midway into the sessions, Young had the impulse to turn it into a Crosby, Stills, Nash and Young project. Crosby and Nash agreed to give it a shot and flew down to Criteria Sound Studios to help out. For a few weeks it looked as if that third CSNY album would finally become a reality. Then, while Crosby and Nash took a break and returned to L.A. to meet the deadline for their own sessions on Whistling Down the Wire, Stephen and Neil continued working. They eventually decided to return to the original idea of the Stills/Young band. Crosby and Nash’s harmonies were replaced by Still’s band. After finishing everything but the final mixing of Long May You Run, Neil Young and Stephen Stills took to the road together. Both canceled solo summer commitments,. Although it wasn’t Stills’s band (George “Chocolate” Ferry on bass, Joe Lala on congas, Jerry Aiello on keyboards and Joe Vitale on drums), the tour was the same one originally intended for Neil and Crazy Horse. Neil caught him in a bear hug, hopped in his bus and headed for Cleveland to beat the traffic. On board his own bus – a more standard travel-only model he rents from Young – Stills spent the ride listening to Long May You Run. He was proud of the album, unabashedly claiming it to be his best work in years. By the night of the Cleveland show, Stephen was ready to kill. He ripped into “Love the One You’re With” with an urgency that hadn’t surfaced since he’d written it. Neil responded with a blazing solo in “The Loner.” Stills came back with a chilling delivery of “For What it’s Worth” . . . and on it went. Suddenly, they were beyond the smiles and the backslapping. The Stills/Young band bore down for a snarling night of what they’d all been waiting and hoping for. The magic. The next night in Cincinnati, Neil let Stephen Stills run with the ball. Stills delivered. The roughest part of the set for him – following Neil’s show-stopping “After the Goldrush” with his own acoustic set – was a breeze. Stills sat down and began gently playing the chords to “Helplessly Hoping.” We it came time for the vocal, gone was the whiskey wheeze of old. Singing slowly and into microphone, Stills let the audience fill in the lilting harmonies themselves. It seemed the proper place to bow out and do just that. Three concerts later it was over. Pittsburgh, Greensboro and Charlotte had been good shows – great by some accounts – and Young was reportedly pleased with each one. By Atlanta, though, a recurring throat illness had silenced him. Young flew home to California, was told to rest by his doctors, and went into seclusion at his Northern California ranch. Rumors immediately pegged the tours cancellation as intentional, and Young hasn’t taken any phone calls or had any visitors. In the meantime, both have canceled all appearances the summer. Young had a tentative ten-date tour with Crazy Horse scheduled for November, just about when he’ll release his next album, Chrome Dreams. Stills, recently sued for divorce by wife Veronique Sanson, is planning a fall tour with stalwart guitarist friends Chris Hillman and George Terry. What Neil has fulfilled or abandoned his drive to revive the affiliation with Stephen Stills is unknown. With Long May You Run just out, Stills is confident that he has not seen the last of Young. After reading this on the Stills & Young Tour, “In which Neil Young and Stephen stills find that old magic and lose it all to a sore throat” I thought I should tell you I invented a device that gets rid of sore throat, old age voice, and hoarseness, in just a few minutes.